Cheap flights from Germany to Puerto Rico in high season from €377! Return flights from Amsterdam to Austin in Texas from €325! Cheap flights from Germany to Puerto Rico in high season from €377! Planning a trip to beautiful Caribbean isle of Puerto Rico in main tourist season is possible with SkyTeam promotion (AIr France / KLM and Delta) when departing from main airports in Germany. Look for return flights from Stuttgart, Hamburg, Munich, Berlin, Nuremberg or Frankfurt to San Juan. Flights are routed via U.S. mainland. (aircraft change in New York or Atlanta). Note that some of the flights may require two layovers in your way. As Puerto Rico is overseas territory of United States of America you would need ESTA or US visa in any case.. Promotional sale of Air France / KLM and Delta Air Lines is available when departing from Germany to San Juan, Puerto Rico from 29th of October to 19th of December 2018 or 9th of January to 31st of March 2019. Latest date if your return flight from Caribbean back to Europe on 11th of April. Blackout period around Xmass. Max stay 3 months. Seems this is kind of a flash sale, discount is available only today 23rd of July. Below you can refer to our booking and few travel date samples. Puerto Rico is a Caribbean island that is a self-governing commonwealth of the United States of America. Located in the Caribbean Sea to the east of the Dominican Republic and west of the US Virgin Islands, Puerto Rico lies on a key shipping lane to the Panama Canal, the Mona Passage. If you have booked these cheap flighs from Germany to Puerto Rico you can read more about this city at Wikitravel. Travel dates. 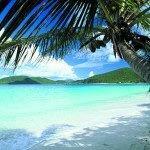 : Compare the cheapest flights Germany-Puerto Rico at website of the carrier. Need affordable hotel in San Juan book your accommodation via Booking.com or Hotels.com. If you have booked these cheap flights from Germany to Puerto Rico you can also compare best prices for car rental in this destination via Rentalcars.com. Booking sample of cheap flights from Germany to Puerto Rico in high season from €377! Your outbound date from Stuttgart to San Juan would be on 19th of January. Inbound flight from this amazing island in the Caribbean Sea back to Germany on 26th of January 2019. Take advantage of this latest promotion with Air France / KLM and Delta Air LInes to the Caribbean. Book the cheapest flights from Germany to Puerto Rico in high season!